I know I will finish this eventually but it’s taking me forever. It took most of the weekend to finish *one *edge. 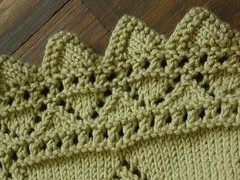 The triangles look great but they’re rather fiddly to knit, especially when I’ve got to knit them on full length 2.75mm pins. I do have some 30cm 2.5mm Addis that I picked up at K&S in Brum……maybe I should try them and see how much of a difference they make to the size of the triangles. Perhaps it’s worth a go for my sanity!